Melt butter in a large skillet over medium-high heat. Cook and stir onions for 10 minutes. Reduce heat to medium low. Stirring frequently, cook until caramelized, 35 - 40 minutes. Stir in mustard and remove from heat. 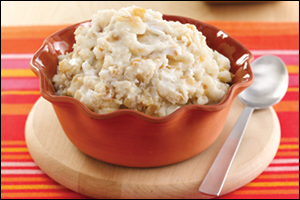 In a large microwave-safe bowl, thoroughly mix potato flakes, garlic powder, salt, and 2 1/3 cups water. Cover and microwave for 3 minutes, or until hot. Stir in onions and sour cream. Enjoy!